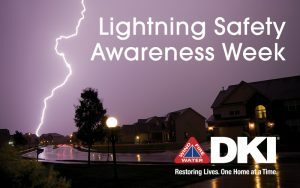 Home > Blog > Safety Tips > Do You Know the Truth About Lightning? Do You Know the Truth About Lightning? How much do you REALLY know about lightning and what it is capable of? Although it may not seem like a threat to our society, lightning is actually more deadly than you would think. According to National Geographic News, it is considered to be “one of the leading weather-related causes of death and injury in the United States.” Thousands of people are killed each year due to lightning strikes, so it is important to know the real facts about this weather condition before you are caught in the middle of a storm. Myth: Lightning always strikes the tallest objects. Truth: Lightning occurs when a cloud has an imbalance between positive and negative electrical charges. It strikes objects that have strong positive charges, and those may not always be the tallest objects in the surrounding area. Myth: Lightning does not strike the same place twice. Truth: It is not uncommon for the same object to be struck multiple times. If an object has a strong positive electrical charge, then lightning will always be more attracted to it. The Empire State Building, for example, gets struck by lightning about 25 times a year. Myth: You are safe from lightning if you are not under the clouds and rain. Truth: Even if you are not caught in the storm, lightning can still strike more than ten miles outside of the center of it. No matter where you are, it is always best to go indoors if lightning begins to strike. Myth: You are completely safe from lightning if you are in your house during a storm. Truth: Staying in your home is one of the best ways to stay safe during a storm, but you must still be cautious. The chances of your house being struck by lightning rise if you use any items that conduct electricity. Houses are covered in electrical conductors, which is what lightning is attracted to. If a storm occurs and you are in your house it is best to avoid using items like televisions, phones, computers, and other electrical appliances. Myth: Rubber tires on your car protect you from lightning. Truth: Your car can help protect you from being struck by lightning. Contrary to what most people believe, the rubber tires of your car are not a contributing factor in this. What actually prevents lightning from striking you is the metal frame. If the car were to be struck, the lightning would travel through the metal and into the ground.